This is our most far-reaching polar expedition, taking in three different locations. The wild and remote environments of the sub-Antarctic Falkland Islands and the island of South Georgia are home to a proliferation of unique wildlife and birdlife. There are penguin rookeries with more than 100,000 nesting birds, the beaches are covered in fur seals and elephant seals, while seabirds, including many of the albatross species, nest and raise their young. The islands have a fascinating human history as well which we will explore with our onboard experts. After exploring these sub-Antarctic islands we will continue to push south to the frozen continent itself, Antarctica. Icebergs in all shapes and sizes fill the waters, and yet more unique wildlife can be found living in sizable colonies. The waters are full of life and we frequently encounter whales including humpback, minke and orca. Having arrived in the Falkland Islands overnight, we launch the Zodiacs and are excited to make our first shore excursion this morning. 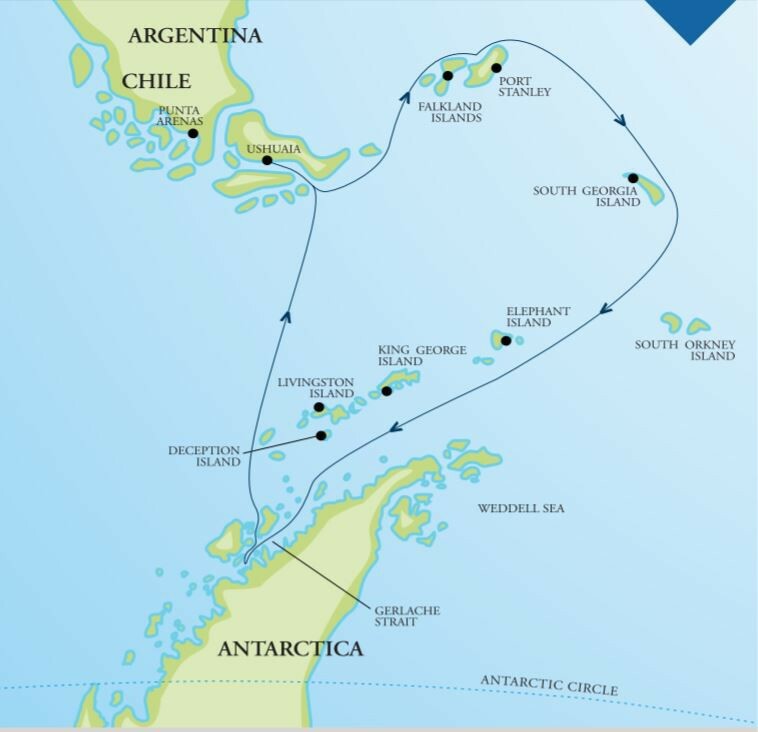 Our plan will be to explore several locations in the West Falkland archipelago. These remote islands are home to a proliferation of seabirds and migratory birds including the stunning black-browed albatross. Our first penguin sightings will be on West Point Island with its bustling rookeries of rockhoppers. On Carcass Island, we observe nesting magellanic penguins as well as oystercatchers, geese and the striated caracara – a bird of prey. The following morning we arrive in Stanley, the capital of the Falklands Islands. As we wander through the charming streets of brightly painted houses, we learn how this quiet harbour was once a major port in the 19th century for tall ships rounding the fabled Cape Horn. There are several interesting activities to enjoy today. Stanley has an excellent museum that outlines the historic events that took place during the conflict with Argentina in 1982. The waterfront memorial built to commemorate the lives of the British servicemen killed during the war is a sobering reminder of recent history. Stanley’s famed philatelic museum with its impressive collection of historic stamps is another interesting diversion. We chart a southeasterly course bound for South Georgia. The seabirds once again join us in the Southern Ocean. Our educational presentations continue and are always popular. History is a key theme of this voyage and the epic story of Sir Ernest Shackleton and the HMS Endurance expedition is central to any trip to South Georgia. Perhaps you will pick up some valuable tips from our onboard photographic guide, learning about image composition, the subtle polar light and all the basics of good camera craft. We will also learn about Polar conservation - a theme particularly close to the hearts of our One Ocean Expeditions’ guides and crew. South Georgia has often been called the ‘Serengeti of the Southern Ocean’ – and as we approach the deep bays of this rugged, rocky outcrop, you will begin to see why. Launching the Zodiacs we begin our exploration of the island, in the vicinity of Elsehul Bay. Large numbers of fur seals and the much larger elephant seals will line the dark sand beaches. Living in the tussock grass, king penguins and their chicks may number up to 100,000 birds in some locations, including Salisbury Plain, St Andrews Bay and Gold Harbour. The island is also home to large numbers of nesting albatross as they fill the skies above, coming and going from the nest. South Georgia is a thrilling location for history lovers and the rusting relics of the early whaling industry are all around us. We hope to observe several of the old stations at locations including Leith, Husvik and Stromness. A highlight is a visit to Grytviken – the largest of the whaling stations, situated at the head of Cumberland Bay. It is here we visit the gravesite of Sir Ernest Shackleton. For many, being in the presence of the great explorer will be a highlight of the trip. An excellent museum at Grytviken, maintained by the South Georgia Heritage Trust and the restored church built by the original Norwegian whalers provides a fascinating glimpse into the past. Around 60 miles off the coast of the Antarctic mainland we find the South Shetland Island chain. Possible landing sites could include King George Island, Half Moon Island or Yankee Harbour. Weather conditions permitting we sail the ship into the flooded volcanic caldera of Deception Island. There are some outstanding hikes at these locations and the old whaling station and aircraft hangar at Deception Island beg for further exploration. After so much anticipation, we enter the icy waters of the Antarctic Peninsula in the vicinity of Mikkelson Harbour or Cierva Cove. Snow covered mountains soar from the dark waters. Along the shoreline in the bays and harbours of the Peninsula lives an incredible abundance of wildlife. Large rookeries are home to chinstrap, gentoo and Adelie penguins. Seals live on the ice floes, including the powerful leopard seal that we hope to encounter. Gulls, skuas and cormorants are also found nesting and feeding at many sites along the Antarctic Peninsula. We explore by Zodiac boat and ashore where a range of exciting activities await. Locations we hope to visit include Wilhelmina Bay, Orne Harbour, Cuverville Island and the Errera Channel. Join the photographic guide taking pictures of stunning icebergs. Or enjoy a hike to the top of a snowy mountain saddle with one of our adventure guides. If the opportunity presents itself, visit a science base or an old historic hut. The sea kayakers may explore up to several miles from the ship, for a truly memorable experience.